Purses, purses, purses! What is it about little containers that are so mesmerizing? I continue to create new designs for purses, baskets, jars and other containers. I want to share my designs with you. This is just a one of many to come. The instructions are for those who already have some basic experience in beading. I use Silamide thread for all bead embellishment. The Conso thread used for warp threads in your loom can also be used in the strap of the purses. I use fine quality Czechoslovakian and Japanese glass seed beads in my work. I often use found objects to incorporate into my pieces. I use all kinds of beads in larger sizes including unusual plastic beads and forms if the color is permanent. I use English sharps and beading needles for seed beads. Sewing needles can be used to sew finished woven purse parts together. I use my bead sharps needles size 11 or 12 or size 12 quilting between needles to sew the pieces together; whichever is nearest when I am ready to sew. Look at the two images for my Label Purse. Each side offers a completely unique mood. This purse is not hand woven; it is created with clothing labels. I included it so you could see how various motifs can be combined in one piece. Various fiber techniques can accomplish real mood grabbers. I used the label of a 20's Flapper on one side and the same label on the other side but with an angel label on top of it. By placing the angel label over one of the flappers I keep part of the black lines with the angel motif, thus keeping the color elements on both sides. The side with the angel has silver lined crystal (Color One), opal Ceylon gray (Color Two) and pink transparent rainbow (Color Three) size 11 seed beads; giving a light warm aura. 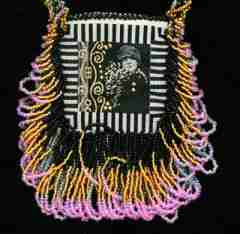 The beads on the side with the Flapper has black opaque (Color Five), gold silver lined (Color Four) and part of the pink transparent rainbow size 11 seed beads; lending a bolder mood. You could easily use two woven pieces with strong motifs and obtain the same results. The Angel Label has gold and silver threads incorporated into the piece and the Flapper has gold threads worked into the label. This all makes the piece very harmonious even though there are two very different themes presented. First you need to obtain some labels. You will probably have to go to specialty fabric stores or sewing centers that offer lots of classes such as quilting and stitchery. They always seem to have designer labels. You may also find them in fiber related catalogs. If anyone knows of a catalog source please share it with me and I will list it on my web page. The Flapper labels are 2�" long by 2�" wide and the Angel label is 1�" long by 1 �" wide. I never use a sewing machine; I make everything by hand. That means I don't do linings unless I have to. I have so much electricity in my body I jam all sewing machines I have used. I fiberjest you not. So here is my answer. First I tacked the Angel Label down on top of one of the Flapper Labels. Then I got some fusible interfacing and fused one to the inside of each of the Flapper Labels. Fiber-Do! Lining! Then I bead edged around the Angel Label so it would stick out from the label it was attached to. Next I stitched the two labels together leaving the top open. For the opening you can make a decorative stitch around it and tack down edge of the interfacing at the same time or you can make a bead edging. I used a bead edging stitch; however, you could easily put three size 11 seed beads on doubled thread and go into the front side of the opening and then around to the inside of the opening and back out, then take another three beads and go from front to back making a spiral of three beads around the opening. When finished, take your needle and go to the edge of your labels where they are sewn together and tie off. Next you would make fringe with beads much like the Victorian Purse. 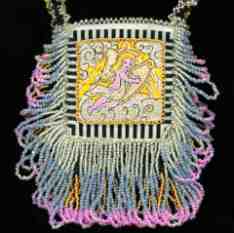 The bead fringe is much longer on this purse because each group of beads includes the same number instead of the first and last group staying three beads like those in the Victorian Purse. The longest length at the bottom middle is 13 beads of Colors One through Five. 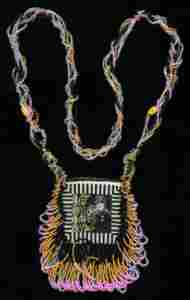 The purse strap is an intermingling of seed beads and larger beads. If you just string a strand of seed beads and then when you get to the second strand stop occasionally and take your needle into the original strand and back out, add a large bead here and there, continue with other strands, pretty soon you will have a designer beaded strap. You could also make fiber straps on any of these purses. You can braid, crochet, knit or macram� straps. I have made several this way and highlighted some with a sprinkling of beads. If you know how to bead edge stitch you can duplicate my design on the Label Purse by using basic peyote edging with one bead between each stitch. You can learn basic edge stitching on fiber in my book, Medicine Pouch Jewelry ($6.95+$2 S/H). This is a step-by-step book of bead embellishment on fiber for beginners.